Egret Earrings Gold Jewelry French Curve are bird earrings fashion fun from Anwo.com Animal World®. Made in USA with detailed Gold on a gentle curve to capture and glimmer the light. Measures 1.5" high x 3/8" wide as shown. 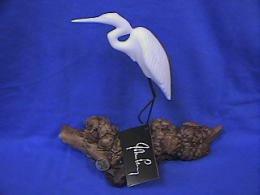 Shop our Blue Heron Gifts Store at Anwo.com Animal World® page for additional Blue Heron gift items. Shop our Egret Gifts Store at Anwo.com Animal World® page for additional Egret gift items.